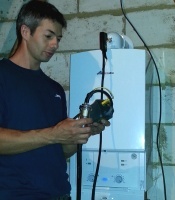 All boiler manufacturers recommend annual servicing and safety checks to ensure safe and efficient operation. Any gas boiler or appliance that is not checked and serviced regularly can develop problems - this will often lead to inefficiency and higher running costs, or even more serious faults that can lead to the production of deadly carbon monoxide (CO). Analysis of flue gas (this measures the levels of carbon monoxide, oxygen and carbon dioxide being produced). Inspection of seals (these prevent the products of combustion from entering the room). Inspection and clean (if required) of the burner, condensate sump and fan. Operational check of any safety devices present. Check and adjustment of inlet and burner pressures. Tightness test of the entire gas installation (this insures no gas is leaking into the property). Landlords are required by law to ensure the safety of their tenants by having all gas appliances tested annually, so if you're a home owner it makes sense to do the same.